I owned this album. Not a cassette or a CD, but vinyl. At one time I probably knew every word to every song on it. 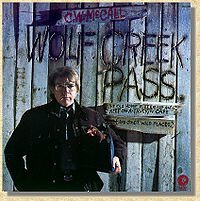 For whatever reason the lyrics to Wolf Creek Pass came to mind this morning and so I Googled it. Handy, this Google stuff. Here are the lyrics from Wolf Creek Pass by Bill Fries and Chip Davis. Anyone else feel all warm and fuzzy with memories when you read these?